Night fishing can be a lot of fun – temperatures may still be high, but at least the sun isn’t beating down on you, and there are no water skiers or jet skis to deal with. The fish bite really well at night in the summer, too, and it just seems more relaxed. 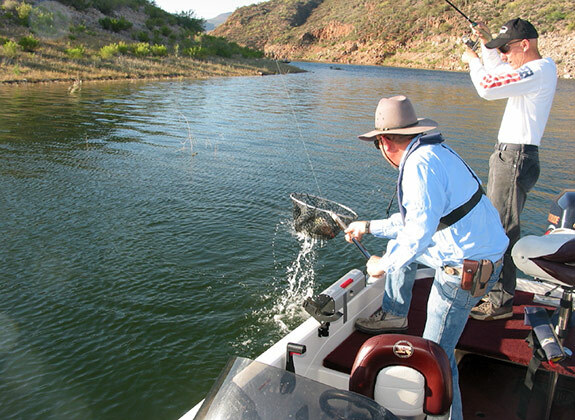 You usually have a lot more time to fish in a night tournament as well – generally around here (PHX) they go from six at night to seven in the morning, which gives you a full thirteen hours to fish instead of the nine or ten you’d get in a day tournament. Over years of fishing night tournaments, mostly on Roosevelt and Pleasant, and fishing at night with a variety of partners, I’ve learned a few things that help put the big fish in the boat. Once the sun begins to set, you no longer have to deal with jet skis or skiers -- it's a lot more relaxing than fighting summer day lake traffic. Yeah, paper maps are old school and why would you need one when you have that $7,000 12-inch GPS/depthfinder on the front of your boat? The short answer – structure. As in how to find it. All my best night tournament fish have come off deeper structure off shore, and those places are hard to find unless you want to drive your boat back and forth over the entire lake to graph it. I have a huge paper map of Lake Pleasant that I pieced together from old USGS topo maps made before the lake came up. Since Pleasant can vary up to a hundred vertical feet per year (most of that is dropping water in summer), I have contour lines marked at twenty-foot intervals in different colors. This makes it very easy to see structure no matter where the lake is. Check the current level on the boat ramp as you launch – there are markings in the concrete. It took a long time to mark all those contour lines, because I didn’t just do the shoreline – I marked the entire lake. That makes it very easy for me to see great structure at the right depth, even if it’s out in the middle. Say the lake is at 1600 feet. I’m seeing bait fish at 30, so I check my map to see what color is closest to 1570. Then I just look for that color marking underwater humps, good drop-offs, etc. Not everything in the lake is marked with a buoy, and the unmarked stuff is the best. Once you locate these and get your boat over them, then you can use that fancy GPS to make it easy to get to next time. I can catch a ton of fish at night throwing a crankbait along the shoreline. A ton. But prefishing for a major tournament taught me that the big Berthas are usually not on the shore. They’re on that offshore stuff that your map helps you find. Some of the better places are humps out on a point, creek channels, rock piles, and those places where a hill dips down then comes back up. Sometimes these are so subtle that they don’t actually show up on a paper map because the contour lines are ten feet apart. 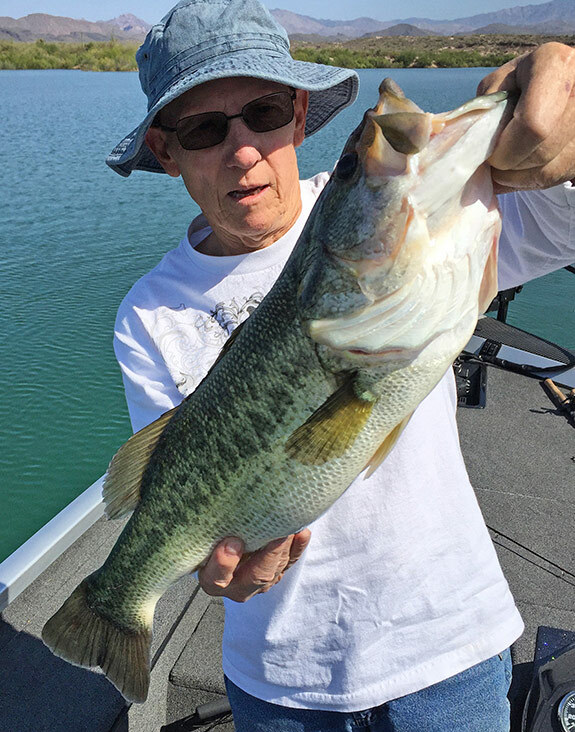 When you’re fishing a point, follow that thing out and if you find a hump or a rockpile, mark it and note the depth – and put that on your paper map in the right color. When you're fishing offshore, be prepared for big fish, and be ready to net your partner's fish. We found a lot of great off shore structure at Lake Pleasant on the east side of the main lake in the Jackass and Honeymoon cove areas. There are also a lot in Coles Bay, Bass Bay, and Humbug. You can set up quite a little milk run once you’ve got a few spots marked. By the way, if there is a channel near your hump it’s gold. All of my biggest night fish have always come on Yamamoto Twin Tail Hula Grubs and skirts fished on football head jigs, or big bulky baits like Psycho Dads or Cowboys rigged Texposed. It’s dark at night, so I like to use a bulky bait that displaces a lot of water and makes it easy for a big hungry bass to home in on it. I know that fishing with an open hook at night is just begging to get hung up, but I do it anyway – I just constantly touch up my hook points – having that point exposed makes it a lot easier to set the hook on a big fish. I use dark colors at night so they show up well silhouetted against the sky. I use a big worm and jig rod with a lot of backbone, and a fast reel that holds a lot of heavy line. I prefer 15- to 17-pound-test mono. At that weight it doesn’t stretch much, and that line is easy to fish. I also like to use fluorescent line at night and I put a black light on the boat so it lights up that line like rope. Makes it easier to see the nibbles. I use a fairly light weight, but heavy enough so I can feel the bottom – usually about 5/8 or so. If it’s windy I’ll go heavier. Since I’m bouncing and dragging the bait, I need to be able to feel it. You never know what kind of bite it will be – sometimes they thump it, sometimes the line just goes off sideways, and sometimes it just feels like somebody cut the line and my lure is gone. Hooksets are free, so anytime it feels weird, slam it home. If It wasn’t a fish, no harm done. Hula grubs on football head jigs are classic night fishing baits. There are two of you in the boat, and you should both be doing something different. One night at Pleasant I was fishing jigs and my partner was fishing a big deep-diving crank. We’d pull up to a hump and he’d throw that plug and almost always get bit a couple times. It was hard to land them on the crank, but that let us know that there were active fish there, so I’d drop the jig down and fish for the big ones. Our winning sack that night had a mix of crankbait and jig fish. Of course, that’s in a team tournament. In a draw, you do what you gotta do. It’s a lot easier if the guy on the front throws the plug because he can throw forward and give the guy in the back some room to fish a jig or some other plastic. If the guy in the front is fishing plastic, his line is going to drag behind and get in the way of anything the non-boater is trying to throw. That doesn’t have to be a crankbait, either, of course. I’ve had great luck with big dark spinnerbaits at night too. I’ve got some ¾-ounce black-bladed spinnerbaits with black heads and red skirts that are absolutely awesome at night. The blades are big old thumping Colorado blades. Those are great for slow-rolling over a hump, and they’ll go right through the trees. There are some great cliffs and bluffs at Lake Pleasant and at Bartlett and some really steep banks at Roosevelt that work just as well. The thing about bluffs is that rocks fall off of them from time to time. You can look at a cliff and see the lighter color where a big chunk fell off at some time. That chunk is now in the water at the base of that cliff and it probably has bass around it. Nighttime is a great time to bounce something down the cliffs. My favorite thing to fish on a cliff is a big Yamamoto grub or single tail Hula Grub on a pea head with the hook exposed. Toss it to the wall and let it fall until your line goes slack, then close the bail and take up the slack. Pull it just a little and let it fall again. You can bounce it right down the side like this, and it will stop on each little ledge until a fish takes it. If it stops without hitting a rock, set the hook. Cliffs and bluffs are the only times I break my rule about shore fishing at night. 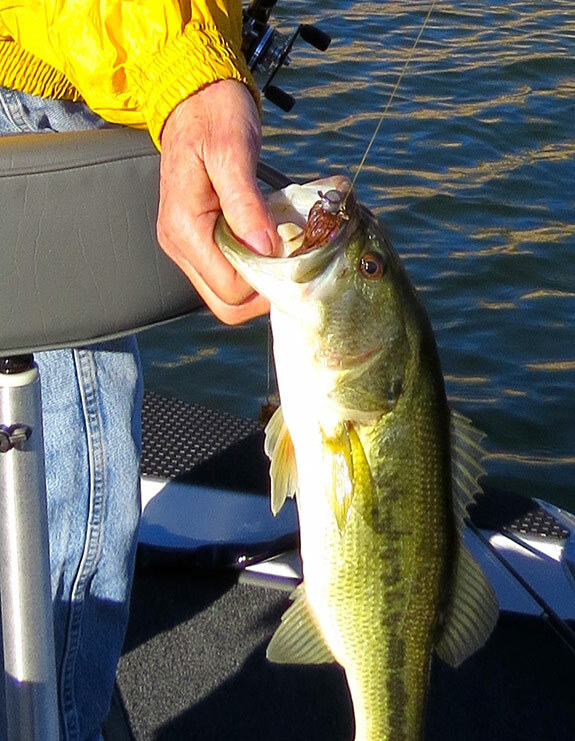 They are great because you can fish so many different depths without moving the boat. Night fishing can be dangerous. Huge monsoon storms can blow up suddenly, and I’ve been caught in plenty of them. It’s not fun. Have a weather app or weather radio that can give you warning. A big spotlight is another must. Get the biggest brightest one you can – it will help you avoid running up on shore. No joke – I’ve seen it happen many times while I was night fishing. You think you know where you are, but you don’t. Turn at the wrong time and you’re on the rocks. A head lamp or a light that snaps to your cap brim will help you see to tie on at night. Get one with red lamps to keep the bugs down. Speaking of which – don’t forget your bug spray. The law says you have to keep your running lights on at night, and that back one draws bugs. A hat with a big brim all the way around makes it a lot easier for the guy in the back to fish without the light bothering his eyes. Finally, it’s going to be way too hot to sleep in the truck after the tournament, so unless you have a trailer, you might want to consider getting a small nap in sometime during the night. We almost always pull up on shore somewhere and use our life vests for pillows so we can snooze for a couple of hours. Or put your wife up in a hotel nearby and have her drive you home in the morning. Whatever it takes. A hat like this with a wide brim all around helps the non-boater immensely. The brim blocks glare from the pole light, which can bother you even from behind when everything else is dark. It's especially bad if you wear glasses. I really enjoy night fishing. It’s relaxing, the fishing is great, and the only other people out there are fishermen. Night tournaments are fun but exhausting, so be careful out there and don’t get caught in a storm. And keep those hooks sharp!